Growing up, every Sunday I jumped out of bed at the ungodly hour of 7 a.m. and hurried downstairs to join my mom in her Sunday errands. These typically included going to the grocery store, the butcher and meal planning for the week. My mom, my babushka and I would all get into my mom's car and drive to the stores. I have fond memories of these days. I sat in the front seat and quietly listened to the gossip being shared between my mom and my babushka. 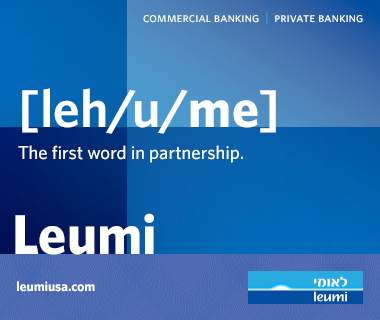 Mom would rattle off in Yiddish and Russian to babushka all about her numerous dramas with her clients, her disagreements with her sister and random stories that we all laughed and snickered at. I relished these moments. I felt like one of the big girls drinking in the stories and feeling very mature, able to poke fun at my mom and babushka. These moments bound our three generations into one. It was also during these shopping trips that my mom taught me how to pick out produce and meat, like how to find the ripest tomatoes and the brightest tasting pineapples and how to pick the right cut of marbled beef for a pot roast. I even learned how to plan meals for the week on a budget. Momma was a genius to me for being able to run a household with the flick of her hand all while waving a fist at me and my brother for getting into yet another useless argument. 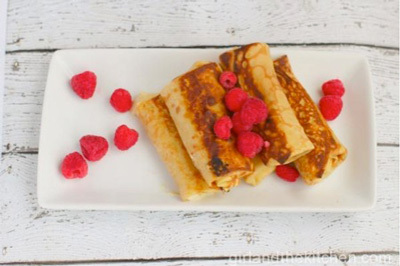 These Sundays became extra special, however, when my mom made her famous crepes – batches upon batches of vanilla-infused and orange zest-laced fluffy and chewy crepes. 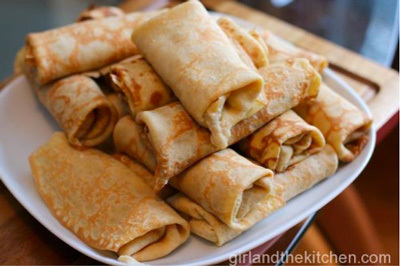 My mom would whip them up in minutes, using only a whisk and a frying pan, always eyeballing the ingredients and always sharing the first crepe with me and babushka so that we could decide on the flavorings. In 30 short minutes my brother would come stumbling down the stairs with his hair still gelled up from the night before and my dad would come in from walking the dog. Together we would all sit at the table, munching on crepes, jam and Russian-style cottage cheese. My mom never ate more than one crepe. Instead, she sat at the table and listened to our quiet chews and loud banter, taking it all in over a steaming cup of tea, always having a clever anecdote or joke to add in to whatever conversation we had at that moment. I fondly look back on those Sundays and I can still hear the echo of laughter in the corners of that house. After my mom passed, I kept trying to recreate her crepes. More than trying to recreate the crepes, I tried to recreate those moments. Alas, they had slipped away and I was devastated that I could not have them again. It was too hard to make them without her, so I stopped and never picked up a crepe pan again, not until culinary school as French crepes were part of the curriculum. When I had to make them, I felt my mom by my side and I recreated her crepes. My teacher, a French chef named Michele, tasted them and smiled at me. "Ziz are amazzzzing," he said in his heavy French accent. "Go ahead and put some crrreme in zem and serrrrve to the other classmates." And I did. I slathered some flavored ricotta cheese on the crepes rolled them up and threw some fresh berries on top and I saw the same enjoyment come across their faces that my mom must have seen on our family’s. 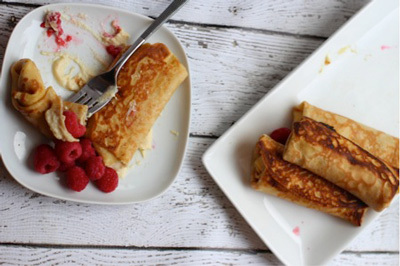 I made these stuffed crepes at various catering functions and for many of my clients, always using mama's recipe. Now, I get to create these crepes for my little munchkin. I watch as she chews quietly with a wide smile. First we start with the batter for the crepes. Combine sugar, flour and salt in a large bowl. 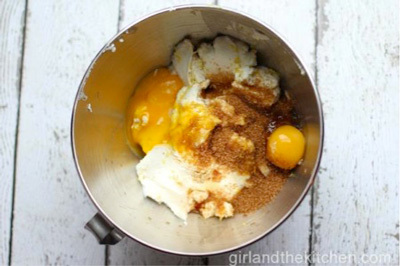 Combine eggs, milk and melted butter in a large bowl and whisk to combine. 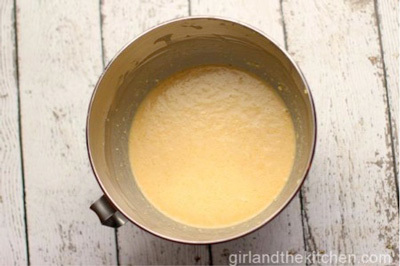 Add in egg mixture into flour little by little to ensure that it's all incorporated and batter does not get lumpy. Add in your orange juice and vanilla extract. Let the batter rest for 30-45 minutes in the fridge so that gluten relaxes a bit. In the meantime, make cheese filling. Combine ricotta, cream cheese, egg, orange zest, sugar and lemon zest until well mixed. Set aside. Take an 8-inch crepe pan and heat up to medium high heat. Take a stick of butter and cover the surface of the pan with the butter just enough so there is a small layer of butter bubbling up. Once you see the bubbles take a ladle of batter, pour into the center of the pan and swirl around with your wrist. Do this quickly. 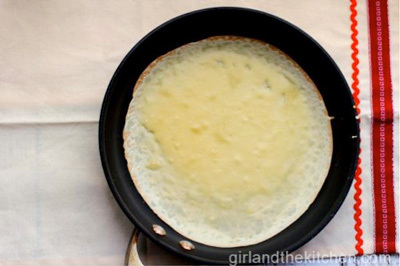 Once the edges started getting golden brown, about 1-2 minutes, take the crepe out. 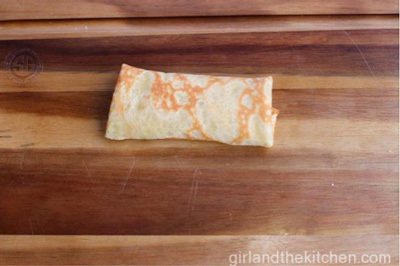 You only need to do one side of the crepe if you are rolling them up. If the edges look like they are getting too dry, turn down the heat a bit. Always taste the first one for flavor. Continue making the crepes stacking them carefully one on top of the other until the batter is gone. 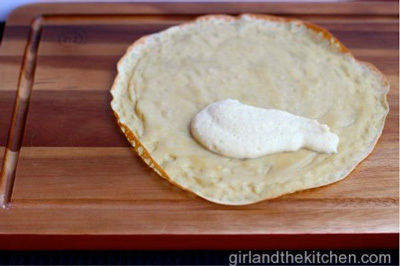 Take the white side of the crepe and place it facing upwards on a cutting board or any other flat surface. 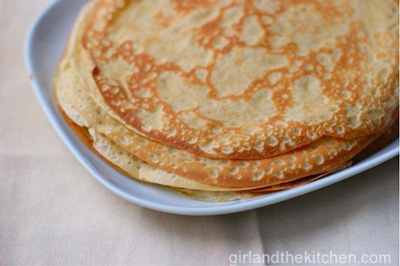 Place about two tablespoons of ricotta mixture onto crepe like so. 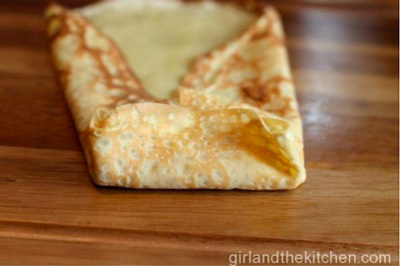 Fold the crepe in half over the filling and then fold the sides over, wrapping it up into a neat little mini burrito. If you are making these ahead of time, you can freeze them at this point. They will be perfect once you defrost them and fry them up in a pan for a bit. At this point, you can either pan fry them quickly to seal them shut and warm them up, or you can place into a preheated 375-degree oven in an oven-safe pan and warm them up just in time for brunch. Sprinkle with some powdered sugar and berries and a sweet and chewy delight is headed your way.